Browse:Home Wilnoteka Young Poles in the group of the best in Lithuania! 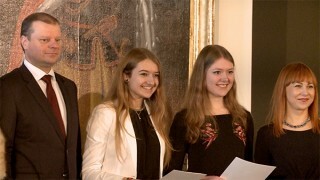 On the 5th of January, during the cold yet sunny afternoon in the Palace of the Grand Dukes in Vilnius, in the presence of the Prime Minister of Lithuania Saulius Skvernelis and the Minister of Education and Science Jurgita Petrauskienė, was held the grand award ceremony for winners of the last year’s international subject olympiads and competitions. Among those who were awarded (over 50 contestants) there were 6 students of Polish schools, some of whom had already become university students. For Julian Germanowicz, a student of the third grade of the Konstanty Parczewski Junior High School in Nemenčinė in the Vilnius region, the year 2016 was undoubtedly successful. He has a long list of achievements. And among the biggest ones is possibly the silver medal won at the 3rd International Music Olympiad in Klaipėda. One of the four “Olympic disciplines” involved performing an original piece of music. Julian presented his original composition of kujawiak oberek for two pianos to the jury. Why such a choice? “I dance in ‘Perła’ and sing in ‘Wileńszczyzna’ so that the melodies of kujawiak and oberek are familiar to me. What is more, the olympiad jury evaluate composition originality. I assumed that no one would compose kujawiak oberek. It turned out that this was the right choice” – he claimed. Alicja Rusiecka, a music teacher and methodologist at the Konstanty Parczewski Junior High School in Nemenčinė was extremely and positively surprised with her student choice. At the national olympiad he performed another piece he composed, “Rondo”, which was a little more modest, but also beautiful. And now – kujawiak oberek for two pianos! “Obviously we have been working on that piece for a long time. Julian has always had his own opinion. And to be honest, I liked it very much. But what I liked most was the decision to take kujawiak oberek” – argued Ms. Alicja. Daniel Daukszewicz and Roland Okińczyc, this year graduates of the Władysław Syrokomla High School in Vilnius took respectively the 1st and 2nd places in the orathorical contest being a part of the 14th Russian Language Olympiad (where Russian could be either native or foreign language) that took place in Moscow at the end of November last year. Almost 160 contestants from more than 30 states participated in it. They were divided into two groups – a native language group and foreign language group. “In the contest held in connection with the olympiad you were supposed to select and present the topic. In such a way that the audience and jury are inclined to believe you. I think they believed us. Obviously, we are delighted. That was not only a real challenge for us, but most of all a great opportunity. And we managed to use that opportunity. We are very happy to have participated in it” – said Daniel modestly. Conversely, though, teachers of these boys – Halina Untanienė and Teresa Borkowska – lavished praise on them. “We may boast about the boys who are not only smart and good-looking, but also very ambitious. At the olympiad they could self-assess their level of Russian language proficiency. As they respect themselves, they decided to choose C1 level, although our school provides them with B2 level, which means that they took the level of foreign language philology students. We take pride in the fact that they know their own worth and set the bar high” – said H. Untanienė, a Russian teacher and methodologist at the Władysław Syrokomla High School in Vilnius. “We wish them a good journey and further success, hoping that the Russian language will remain important for them” – added T. Borkowska, a Russian teacher and methodologist from this school. Adrianna Wołosewicz, who is currently a student of the 1st year medicine at the Vilnius University and last year graduate of the Władysław Syrokomla High School in Vilnius, took the 2nd place at the 46th Polish Literature and Language Olympiad that was held in Warsaw and Konstancin in April last year. Karolina Słotwińska, who is enamoured with Henryk Sienkiewicz, has moved forward step by step to participate in the olympiad. She is this year graduate of “Syrokomlówka” and winner of the 3rd place. The 3rd position was also held by Magdalena Bielawska, a graduate of the Adam Mickiewicz Junior High School in Vilnius and the 1st year student of architecture at Vilnius Gediminas Technical University. Overall, more than 100 Lithuanian students took part in the international subject olympiads and competitions and over 50 were awarded last year – they took home 2 gold, 12 silver and 22 bronze medals, and over 20 other prizes. Congratulations!